In one, the exchange company acquires title to the replacement property on behalf of the taxpayer until the taxpayer sells his old property. In the other, the exchange company purchases the relinquished property (the taxpayer's old property) and holds or "parks" it, pending the sale of that property to a third party buyer. 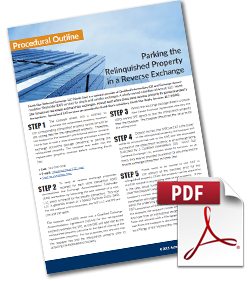 In this whitepaper, we've broken down this second procedure, in which the relinquished property is parked, into an explicit and easy to follow series of steps.